You’ve heard the success-wisdom expression, “When one door of opportunity closes, another door of opportunity opens”? Here is one way that this empowering wisdom works. When you feel frustrated by your effoprts to accomplish a goal, this does not have to cause you to feel stuck. If you seem blocked from accomplishing something you want, look at the reasons why you want it. Although you may not be able to achieve your goal right now, you CAN do things to experience more of the success and satisfaction you want FROM that goal. For instance, if you want to make more money, but you have not been able to do that, think about the reasons WHY you want more money. Let’s say one reason is so you can feel free of economic worries. To apply a wise strategy for success, focus DIRECTLY on gaining your freedom from economic worry. How can you do this? By doing internal self-work for emotional liberation from dependency upon external circumstances to feel internally secure and confident. So one open door to more success in this situation is to do the self-help work of strengthening your emotional security, trust and confidence without waiting for your economical condition to change. The great success secret being presented here is simply this: Whatever it is that you want, when the way to it seems blocked, step back and clarify the most important reasons WHY you want it. 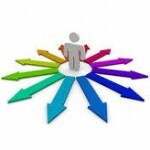 Then look for creative, alternative ways to satisfy those WHY’S and you will experience more success and satisfaction. Don’t get caught up in a fretful, futile power-struggle with your life. Look for alternative ways to experience more of what you want right without having to manifest that goal first. This simple practice will reveal to you your open path to more accomplishment and fulfillment. The more you practice this approach to succeeding in life, the more you develop the habitual success mindset of looking for and taking full advantage of your open doors instead of wasting your life on worrying about the closed doors. A common mistake people make is to put off their satisfaction and success until they achieve some big, over-arching goal. When a door of opportunity seems closed it is often because we are placing the cart before the horse. We think we need something to happen BEFORE we can have a particular experience, when that is not indeed the case. Remember this creative success secret of the open door: you can always find alternative, creative ways to experience or accomplish more of what you expect to get from any goal presently beyond your reach. Your attitude impacts your performance and relationships. For a high level of individual and team performance, you need a highly motivated team. Performing well and maintaining positive, productive relationships demands that you feel energized. Your level of motivation is an expression the degree to which you feel energized. When a high degree of motivation is sustained, individual performance and teamwork can skyrocket. When workers feel highly motivated, they exude a positive attitude, creating an inspiring workplace atmosphere. An environment that is positively charged with the attitude of motivated people is a healthier and more productive environment than one in which workers feel disgruntled or the staff feels bored. Motivational Tip for Team Building: Great teamwork requires a serious commitment on the part of leadership to provide to the employees with regular, consistent motivational team building. Think of motivation as the “juice” in your “internal power-battery”. we deplete the positive energy in our battery. When motivation is low, the positive energy in our “internal power-battery” has been depleted. Whatever the cause of the decline in worker motivation, performance declines co-measuredly. Regard the level of employee motivation as a true “energy resource” that is essential for the success of your organization. Motivators are contagious. To produce or to be part of a more motivated team, be self-motivated. DE-motivation is ALSO contagious. Spend no more time than you must with someone expressing low morale, or that person’s negativity can drag your down. When YOU feel unmotivated, take a break from your work (or take it easy at your work) and try to spend time on your own, to avoid being a drag on others and to avoid being further dragged down by others. Since your attitude impacts your performance and your relationships, as you preserve, nurture, and protect your own power of motivation, you will enjoy the greater rewards of higher performance and more supportive relationships. Routine team building trainings and events aimed at supporting and recharging team spirit are essential for the highest level of workforce performance and productivity.